Slow cooking cheaper cuts of meat isn’t always the best option if you’re on a budget. While the meat is cheaper to buy, I can’t neglect the fact that energy costs money. This beef salad requires very little cooking and uses a cut of stewing beef. I do this the night before I intend to eat the beef salad, but you could sear the steak at lunch, and have this for dinner. Take a heavy bottomed non-stick frying pan and heat it gradually until it’s smoking. Sear the steak for 4 minutes each side. I don’t use oil as there is normally some fat/marbling in the meat which helps the searing process. Remove the steak from the pan and put it on a plate, cover with cling film and allow to cool to room temperature before refrigerating for at least 3 hours. Slice the tomatoes and chillis thinly, rip the toast into bite sized portions. Mix the remaining ingredients for the dressing in a large salad bowl, then toss the chopped tomatoes, chilli and toast in the dressing. Allow the toast to soak up some of the dressing. Take a very sharp knife and slice the beef as finely as you possibly can. Wafer thin strips work best. Add to the salad bowl and toss everything together once last time before dividing into portions and eating. Publication day is rapidly approaching and the book is now available to pre-order on my publisher’s website. I’ve arranged a discount code for my readers so use “wholesome20” when ordering to buy the book for €15 which also includes free postage. You can click on the image of the book cover below to order. Can’t wait to try this. I visited Ireland in June 2014 and loved it! I’m Canadian and when I was there a lot of places served a type of cream with biscuits or scones and I’m trying to figure out what it was – it was so tasty. We have cream cheese here but it was lighter than that and so good. Would it be creme fraiche? I asked for cream in my coffee at one place and they gave me this thick cream. Anyway, thought you might know what it is. Love your blog and your country. Hi Sandra, thanks for visiting. I’m not too sure which cream you would have eaten with your scones but it could have been clotted cream which is a great treat. Alternatively it could have been whipped cream (I’d guess it’s more likely to have been this) If you asked for cream for your coffee you would have been given pouring/whipping cream – and not milk or creamer. This looks wonderful. The chilli peppers real complete the look of the dish. Thanks for sharing. Thank you. 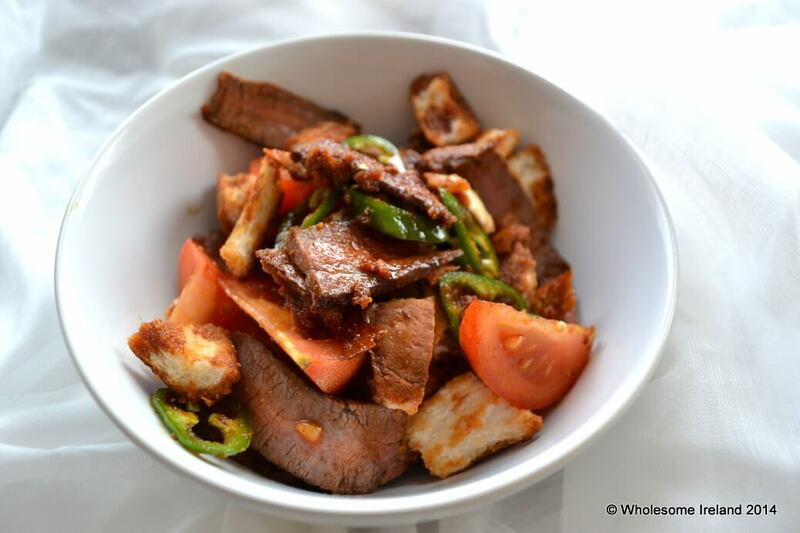 Personally I think that chilli peppers and beef are a magical combination! I love beef salads but have never tried this way of cooking stewing steak. I’ll have to give it a go. Definitely give it a go. It’s very easy and tasty. Thanks Simon I hope you enjoy it!